1Federal Institute of Saint-Campus Colatina Spirit Avenue Arino Gomes Leal, 1700, CEP 29700-660, Santa Margarida, Colatina-ES-Brazil. The incorporation of blast furnace sludge to clayey mass has been studied as a way to reduce the environmental impact of the improper disposal of this waste and to reduce the consumption of raw clayey material. We evaluated the behavior of the clayey mass used in the structural ceramic industry with the incorporation of blast furnace sludge in spheres manually molded and pressed bars. Samples of blast furnace sludge and clay were prepared and submitted to chemical, physical, mineralogical characterization and to thermal behavior analysis. Specimens with contents of blast furnace sludge from 5% to 100% were burned in an industrial furnace-type tunnel at a maximum temperature of 850°C for 24 hours in the pottery. The ceramic properties evaluated were water absorption, apparent porosity, apparent specific mass, flexural strength and compressive strength. The results indicated that the incorporation of 5% of blast furnace sludge in the clayey mass caused improvement in the ceramic properties analyzed of bars and spheres. We can confirm the use of the methodology of the spheres in potteries for initial analysis of ceramics raw materials. The steel industry has greatly developed in recent years due to the technological advancement of blast furnaces and the growing demand for products made from steel, which is now the most recyclable and most recycled product in the world. The Brazilian steel industry is composed of 29 plants with an installed capacity of 48 million tons per year . The production of steel generates waste that may cause serious environmental problems; contaminate the soil, air and water, if it is improperly disposed. One of the wastes generated in this sector is the blast furnace sludge that comes from the wet cleaning of the blast furnace gases and the separation of solid particulates. Blast furnace sludge consists of iron oxides from iron ore and coke fines from the carbon [2,3]. In the state of Espírito Santo, located in the Southeast Region of Brazil, there is an industry called Arcelor Mittal, which has a production capacity of 7.5 million tons of steel plates per year and 4.0 million tons of steel bobbins per year; and generates an average 4500 tons of blast furnace sludge per month . In the paper by Almeida and Melo , the blast furnace sludge was classified as class I waste, considered hazardous, according to Brazilian standard NBR10004/2004 , because it presented phenols above the specified limit. Therefore, forms of reusing the blast furnace sludge should be developed to decrease landfilling and storage in the open, thus preventing possible contaminations. The structural ceramics industry in Brazil is also particularly important in the economic scenario, mainly serving the construction industry. According to Anicer – the National Association of Ceramic Industry, there are 6900 ceramic companies in the country, 4400 companies producing blocks and 2600 companies producing roof tiles, which combined, reach a total monthly production of 5.3 billion pieces, consuming 10.3 million tons of clay per month. The ceramic industry in Brazil presents annual billing of R$18 billion reais , thus contributing to the country's economy. The main raw material used in structural ceramic products are common clays generally heterogeneous and constituted of plastic and non-plastic materials, with varied compositions, allowing the insertion of waste from different industrial processes. This research was done in the industrial oven in pottery to consider the temperature and actual duration of burning of roof tiles and blocks to be produced with the clayey mass with blast furnace sludge. The previous studies have not taken this into account. This aspect may decrease the time between laboratory research and applied research in ceramic industry. Almeida and Melo6 studied the incorporation of blast furnace sludge from the steel production to the common clay used for manufacturing blocks in 8%, 10% and 12% (in volume) in the clayey mass, and obtained the highest mechanical strength in 10% content. Prakash, et al. , Almeida MLB and Melo GCB , Oliveira FR, et al. verified that the blast furnace sludge helps to obtain the reddish coloring of the structural ceramic because of its iron oxides; and can reduce the consumption of primary fuel in the furnace during the burning due to its high rate of carbon. As regards ceramic properties, some studies were developed [3,9,10] and they showed that the amount of 5% wt addition of the blast furnace sludge to the ceramic mass is what causes improvement in these properties. Note that the sludge can present different chemical composition depending on the origin and on the treatment process. Despite to the studies, the disposition of steel waste in the open is still a systematic practice, which may cause substantial environmental damage [5,11]. Considering the importance of steel and ceramic industries to Brazil, the generation of blast furnace sludge and the studies of its use in ceramic masses, the aim of this study is to evaluate the behavior of the clayey mass used for manufacturing roof tiles and blocks in the structural ceramic industry with the incorporation of blast furnace sludge generated in steel production, using raw materials from the State of Espírito Santo with samples spherical shaped manually and with pressed bars. Samples of clay and blast furnace sludge were collected in storage piles of the structural ceramic industry located in the State of Espírito Santo. After that, the samples were air-dried, broken with the aid of a pounder, homogenized and quartered. The clay and blast furnace sludge were characterized by X-ray Fluorescence (XRF) in Philips PW2400 spectrometer; X-ray Diffraction (XRD) with copper source (K α radiation) in Philips X- Pert MPD equipment; particle size analysis by laser diffraction in Malvern Mastersizer 2000 equipment; Atterberg limits [12,13], thermogravimetric analysis with a heating rate of 10°C/min in air atmosphere at Shimadzu DTA-50; Scanning Electron Microscopy (SEM) in Philips XL-30 electron microscope. Bars and spheres were molded for the characterization tests after firing. Bars (prismatic specimens) measuring 2 cm x 6 cm x 0.5 cm of the mixture of clay and blast furnace sludge were molded, sieved in # 80 sieve of ABNT - Associação Brasileira de Normas Técnicas, with dry mass of 10 g and a moisture content of 10%, by axial pressing 250 Kgf/cm². And manually molded spheres with diameter of 2 cm of the mixture of clay and blast furnace sludge, sieved in # 40 sieve of ABNT with dry mass of 10 g and a moisture enough content by manual molding were molded according to the methodology proposed by Laboratory of not metallic materials called Professor Persio de Souza Santos (LPSS) of PMT/ EPUSP/BR by researcher Francisco Rolando Valenzuela-Diaz. The spheres shaping is a quick procedure and cost effective for initial study potential of ceramic raw materials for use in the ceramic industry . The blast furnace sludge content in the clayey mass varied from 0% to 100% in weight; and six bars and six spheres were molded for each content. The specimens were dried in a drying oven for 24 hours at 110°C. Then the specimens were burned in an industrial furnace-type tunnel in a structural ceramic industry for 24 hours at a maximum temperature of 850°C. After firing, the following features were: water absorption, apparent porosity, apparent specific mass and flexural strength in specimens according to the methodology proposed by Souza Santos  and compressive strength in spheres. In burned clay specimens with 0% and 5% content, blast furnace sludge analyses were performed: observation of fracture surface in a Scanning Electron Microscopy (SEM) in electron microscope Philips XL-30; and mineralogical analysis by X-ray Diffraction (XRD) with copper source (K α radiation) in Philips X- Pert MPD equipment. The chemical analysis results (Table 1) are shown in terms of percentage through the weight of constituent oxides and the loss on ignition. By analyzing the data, the clay was verified to present a typical chemical composition of clayey raw material, with 43.6% silica, 28.2% alumina; and 14.3% loss on ignition obeying ranges of values from 43.2% to 77.6% for SiO2, from 6.8% to 38% for Al2O3 and from 6% to 15.7% for the loss on ignition, respectively, as specified by Souza Santos  for ceramic raw materials. The percentage of 12.0% of iron oxide is responsible for the reddish color after firing. The concentration of (Na2O+K2O<1.25%) is not high; hence, even being fluxing oxides; they contribute little to the formation of the glassy phase. Clay with these characteristics (silica aluminous, with high iron content and low content of fluxing oxides) observed in XRD demand high sintering temperature, as reported by Hildebrand et al. . Note: LOI: Loss on Ignition; BFS: Blast Furnace Sludge. Table 1: Chemical composition by XRF. As seen in the table, blast furnace sludge presents a high concentration of iron oxide (61.2%) and high content of loss on ignition (25.9%) when compared to clay, corroborating the information in Vieira et al. this value corresponds to the combustion of coke fines present in the sludge. Figures 1 and 2 show examples of bars and spheres molded with the mixture of clay and blast furnace sludge in amounts from 0% to 100% dried in an oven at 110°C. A darkening of the dry specimen molded with blast furnace sludge can be observed, which highlights the presence of a high amount of organic matter, confirmed by the high value of loss on ignition (25.9%) found in FRX. 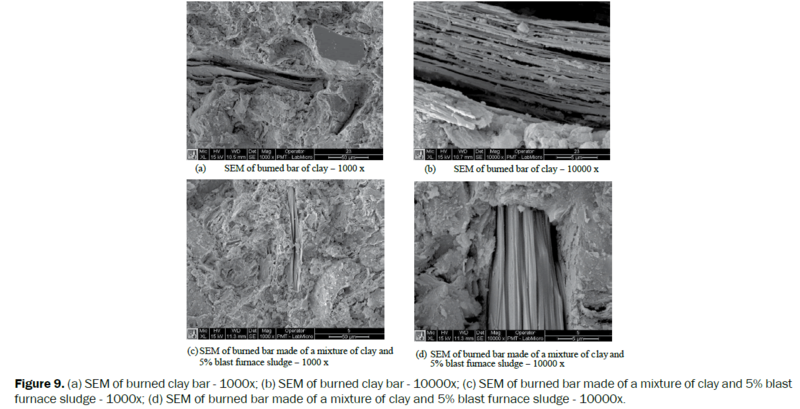 Figure 1: Examples of dried bars at 110ºC (after rupture) of clay with blast furnace sludge with contents from 0% to 100%. Figure 2: Examples of dried spheres (before rupture) of clay with blast furnace sludge with contents from 0% to 100%. Figure 3 shows the X-ray diffraction of the clay. The XRD analysis indicates that the predominant minerals are kaolinite, quartz, illite and possibly goethite. Figure 3: XRD of clay. The X-ray diffractogram analysis of the blast furnace sludge (Figure 4) identifies the presence of crystalline phases associated with iron compounds such as magnetite (Fe3O4) and hematite (Fe2O3), confirming the high value Fe2O3 (61.2%) detected in the XRF. Calcite (CaCO3) and quartz (SiO2) were also detected. The presence of quartz in the XRD also confirms the result of XRF, which presented SiO2 content of 5.11%. The coke fines present in blast furnace sludge were not identified in XRD, probably due to its amorphous character, a fact also observed by Vieira et al. . Figure 4: XRD of blast furnace sludge. Atterberg limits of the materials are shown in Table 2. The clay plasticity index (PI) is 25.5%, or above 15, indicates high plasticity, which makes it suitable for molding by extrusion. However, this amount of clay PI can lead to a larger amount of water necessary for the conformation of pieces, requiring a longer drying. Regarding the Plasticity Limit (PL), the value of 42%, is within the range from 9% to 56% specified by Souza Santos  for a kaolinitic clay, confirming the predominance of the mineral kaolinite identified in XRD. The value of 9.1% for the PI of blast furnace sludge indicates that it is average plastic (PI from 7% to 15%), requiring a smaller amount of water to extrude pieces with the blast furnace sludge. In this case, the mixture of clay containing blast furnace sludge can reduce the amount of water required for the mixture to extrude. The particle size distribution of the clay and blast furnace sludge are shown in Figures 5 and 6, respectively. The effective diameter of the clay is 2.9 μm and the blast furnace sludge is 2.3 μm. These are very close values, indicating that both materials have similar size distribution of the particles, both with 45% of grains larger than 20 μm, and with less than 10% of grains smaller than 2 μm. Figure 5: Particle size distribution curve of clay. Figure 6: Particle size distribution curve of blast furnace sludge. The electron microscopy result indicates that the clay grains (Figure 7) and blast furnace sludge (Figure 8) show an irregular shape with a tendency to form lamellar particles, some scattered and others in clumps with sizes ranging from 2 μm to 60 μm. The texture of the grains of the blast furnace sludge is rougher than that of the clay. 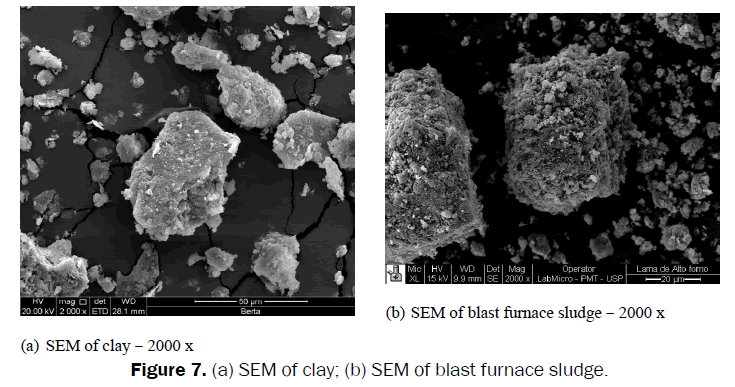 Figure 7: (a) SEM of clay; (b) SEM of blast furnace sludge. Figure 8: Derivative thermogravimetry curves (DTG) of materials. 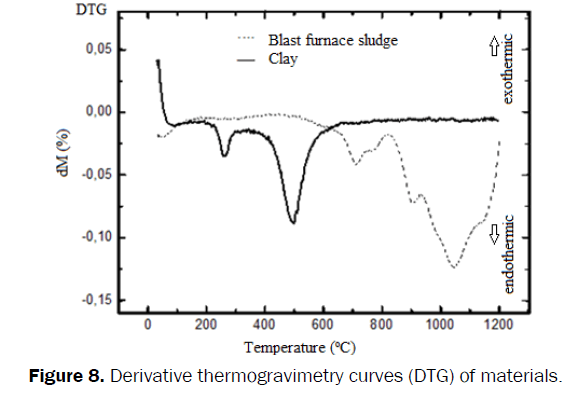 Figure 8 shows the thermal behavior of the clay and blast furnace sludge. In the clay, an endothermic peak occurs between 200°C and 300°C, which probably corresponds to the loss of organic matter. Another endothermic peak of highest intensity occurs at 500°C, characteristic of loss of hydroxyl in the clay minerals kaolinite and illite. The thermal event associated with the vitrification that would begin near 900°C has not been detected, suggesting a possible feature of refractory clay. In the blast furnace sludge, it is possible to observe a well-defined exothermic peak at 825°C. This reaction can be associated with the combustion of coke fines. The oxidation reactions of reduced iron compounds were not observed in the curve, possibly because these reactions are being covered up by the reactions associated with the combustion of coke fines. The results from the analysis of pressed bars are presented in Table 3. The highest value of flexural strength (5.23 MPa) was obtained with the 5% content of blast furnace sludge, which resulted in improvement of this property, once the clay without waste presented a lower value (4.23 MPa). In the spheres (Table 4) the highest value of compressive strength (1.62 MPa) was obtained with 10% of blast furnace sludge. Table 3: Average values of the ceramic properties in bars. 100%BFS n.d. n.d. n.d. n.d. n.d. n.d. Note: BFS: Blast Furnace Sludge; LOI: Loss on Ignition; WA: Water Absorption; AP: Apparent Porosity; ASM: Apparent Specific Mass; LS: Linear Shrinkage; CS: Compressive Strength; n.d: Not Determined. Table 4: Average values of the ceramic properties in spheres. The improvement in flexural strength in bars of the 5% blast furnace sludge results from obtaining lower values of water absorption (24.46%), apparent porosity (37.09%) and loss on ignition (13.38%) in relation to the contents of blast furnace sludge analyzed. In spheres with 5% blast furnace sludge were also obtained the lowest values of water absorption (27.40%), apparent porosity (38.79%) and loss on ignition (13.28%), although the highest value of the compressive strength was obtained at 10%. This value was lower than that found in the sphere made solely of clay. There was also a gradual increase of water absorption, apparent porosity, loss on ignition with increasing the waste content in bars and spheres. The organic matter present in the blast furnace sludge and released during the burning favored the increase that occurred in the loss on ignition, which generated an increase in porosity and water absorption and, consequently, the decrease in the flexural and compressive strength and apparent specific mass of the specimens. The linear shrinkage values did not show significant variations in the specimens studied, with an average of 2% in the bars, and in the spheres there was a slight increase in values of the linear shrinkage with increasing sludge content. This value may indicate that the blast furnace sludge did not significantly contribute to the formation of the vitrification phase, since higher shrinkage means higher formation of liquid phase , which can result in cracks in the pieces. Therefore, the clayey mass incorporated with 5% blast furnace sludge presents potential use in structural ceramic, without affecting the characteristics evaluated in specimens. Considering the values prescribed by Souza Santos  for pressed bars, of a 25% maximum for water absorption and apparent specific mass from 1.5 g/cm³ to 2.0 g/cm³, for evaluating bars made with raw materials used in structural ceramic, the specimens with 5% of blast furnace sludge incorporation meet both values. However, the apparent porosity and flexural strength obtained in bars did not meet the limits prescribed by the same author, a maximum 35% and a minimum of 6 MPa, respectively, at any blast furnace sludge content, including the specimens made solely of clay. This problem can be solved by changing the burning temperature, since the values of porosity and flexural strength at 5% of blast furnace sludge tension, despite not having met the prescription, are close to the prescribed values. The fracture surfaces of reference specimens molded only with clay (Figure 9a and 9b), and the specimens molded with a mixture containing 5% blast furnace sludge which promoted improvement in ceramic properties (Figure 9c and 9d) were analyzed by SEM. The mixing of the materials was observed to be very homogeneous; it was not possible to view the pores and constituent elements of the materials separately. Lamellas of clay mineral can be seen in parts that do not seem to have been soaked by the glassy phase promoted by quartz and fluxing oxides. Figure 9: (a) SEM of burned clay bar - 1000x; (b) SEM of burned clay bar - 10000x; (c) SEM of burned bar made of a mixture of clay and 5% blast furnace sludge - 1000x; (d) SEM of burned bar made of a mixture of clay and 5% blast furnace sludge - 10000x. The XRD analysis of burned clay bars (Figure 10) showed peaks of kaolinite, quartz, illite and goethite, corresponding to the DRX dry clay, besides the possible formation of mullite, from the kaolinite that occurred with a characteristic peak. Figure 10: XRD of burned bar of clay. The metakaolin, for being amorphous, is not presented in the graph. In the bar incorporated with of 5% blast furnace sludge (Figure 11), peaks occur corresponding to hematite and magnetite, main minerals found in the XRD characterization of the blast furnace sludge. The behavior of XRD of the burned bars showed few changes compared to the composition of the dried bars, possibly because the 850°C maximum temperature used in bars did not allow significant changes in mineral phases. Figure 11: XRD of burned bar made of a mixture of clay and 5% blast furnace sludge. The blast furnace sludge is a waste consisting predominantly of iron oxides, quartz, calcite and coke, while the clay consists of silica aluminous with a predominance of kaolinitic minerals. With the incorporation of 5% sludge, an improvement in the mechanical strength of the bars occurred. From 5% on, the increase of the contents of blast furnace sludge contributed to greatly increasing water absorption and apparent porosity, decreasing the flexural and compressive strength of burned bars and spheres. This behavior can be partly attributed to the chemical composition of the blast furnace sludge because its oxides remain inert during firing, and the carbon increases the porosity of the pieces. However, the carbon contained in the blast furnace sludge must have contributed to the complete burning of the specimens used at the maximum temperature of 850°C. The iron contained in blast furnace sludge also contributed to the reddish color presented in the specimens, typical of roof tiles and blocks, products of structural ceramic. Based on the results, the recommendation is to incorporate blast furnace sludge at a maximum content (by weight) of 5% in the clayey mass, and also to determine the best firing temperature according to the type of piece to be produced. Hence, blast furnace sludge is utilized in structural ceramic materials, giving a suitable destination to the waste. It can be verified the technical feasibility of casting the spherical specimens for initial analysis dosage of clayey mass. With this, we have available a simple technique that can be used in any pottery. The authors thank IFES, CAPES, FINEP and PMT/EPUSP. Brazil Steel Institute. The steel industry in Brazil/National Confederation of Industry. Sectoral notebooks. Brasilia. 2012; 50. Vieira CMF, et al. Incorporation of blast furnace sludge into red ceramic. Cerâmica 2007; 53: 381-387. Prakash S, et al. An overview of utilization of slag and sludge from steel industries. ResourConservRecy 2007; 50: 40-57. Almeida MLB and Melo GCB. Alternative uses and applications of solid waste from independent production of pig iron in the state of Minas Gerais industries. In: 21 Brazilian Congress of Sanitary and Environmental Engineering. João Pessoa. Paraíba, Brazil. 2001; 1-13. Brazilian Association of Technical Standards. NBR 10004, Solid Waste-Classification. Rio de Janeiro, 2004. National Association of Ceramic Industry (Anicer). Official data. Rio de Janeiro. 2014. Oliveira FR, et al. Chemical characterization and study of possible applications for the sludge generated in the furnace. In: 5th National Meeting of Chemical Technology. Maceió. Alagoas-Brazil 2012. Mothé AV. Use of blast furnace mud in red ceramic [Dissertation]. State University of North Fluminense, Rio de Janeiro 2008. Lima LHM, et al. Steel waste utilization in clay ceramic blocks. Magazine E xacta, Belo Horizonte 2013; 5: 69-78. Oliveira MRC and Martins J.Characterization and classification of solid waste "balloon powder", generated in non-integrated steel industry charcoal: a case study in seven lagoons/ MG region. New chem 2003; 26: 5-9. Brazilian Association of Technical Standards. NBR 6459, Soil-Determination of liquid limit. Rio de Janeiro. 1984. NBR 7180. Soil-Determination of plastic limit. Rio de Janeiro 1984. Souza Santos P. Technology of clays. V1-2. Sao Paulo: Edgard Blucher; 1975. Miyahara RY, et al. Correlation between mechanical resistance measurements of clay specimens shaped by hand and by uniaxial pressing. Proceedings of the 48th Brazilian Congress of Ceramica 2004. Souza Santos P. Technology of clays. V1-2. Sao Paulo: Edgard Blucher 1975. Hidebrando EA, et al.Application of bauxite waste from amazon region in the heavy clay industry. Mater Res 2013; 16: 1418-1422. Panzera, TH, et al. Effect of steatite waste additions on the physical and mechanical properties of Clay composites. Mater Res 2010; 13: 535-540.